Click here to access new self-serve tools! The Fulton County Board of Assessors reserves the right, when circumstances warrant, to take an additional 180 days, pursuant to O.C.G.A. 48-5-311(3)(B), to review the appeal of assessments of property value or exemption denials. In such case, the Board of Assessors will notify each taxpayer of its decision to utilize the additional time period to issue a determination. In accordance with O.C.G.A. 48-5-264.1, the appraisal staff will routinely field check properties to verify sales, check the status of building permits and review properties that have been appealed. 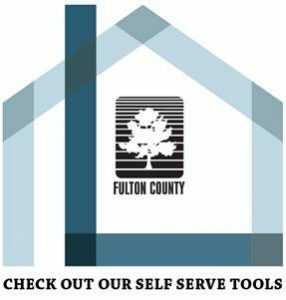 Appraisers will also periodically canvas Fulton County to reconcile our records with businesses that are in operation, as well as those which have closed. Homestead and special exemption applications filed between April 2, 2018 and April 1, 2019 will be applicable for tax year 2019. Applications received after April 1, 2019 will be effective for tax year 2020.